If you are the runner at a table quiz, then your main job is to collect up the answer sheets at the end of every round of questions, and deliver them to the markers or marking co-ordinator. Depending on how your quiz is organized, you may also be asked to enforce the quiz rules (eg look for smartphones being used), help with registrations, help with setting up or clearing away the room, marking question-papers etc, or to take on other roles eg first-aid, fire warden etc. Mobility - able to move around a crowded room or up and down stairs etc quickly. Taking instructions and carrying them out. Confidence and assertiveness: Being firm-but-polite with people who are breaking the rules. Before each round of questions, distribute the answer sheets for that round. 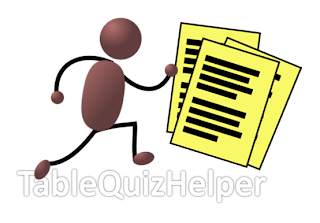 After each round of questions, collect up the completed answer sheets and deliver them to the marker(s). If a team wants extra time, clear this with the quiz-host or quiz-master - and when they call "time" insist on taking the answer sheet away. During each round of questions, circulate through the room looking for people who are breaking the quiz rules. 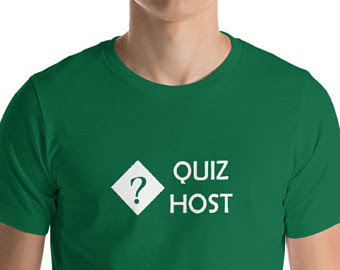 Report any issues you see to the quiz-master or host, or take any actions that they have asked you to take. If people ask you for help, respond according to the policies and rules for your quiz and the venue. This may include asking the quiz-master to repeat a question, turning up the sound system, providing extra seating or refreshments, directions to the bathroom, etc. Other duties as required: because the runner is mainly busy at the end of each round, you may be asked to do last-minute jobs which crop up (eg go and buy milk, find out where to turn on the heating, etc). Hints and tips for table quiz "runners"
Arrive early, and get to know the venue: find out where the toilets, lighting, heating and emergency exits are. Understand the table layout, and where the markers are going to be working. Check that participants can see the scoreboard (and other screens if a projector is going to be used), and hear the sound system. Once the quiz starts, keep looking around so you see anyone who may be looking for assistance. Check that each answer sheet has the team name written on it when you collect it.